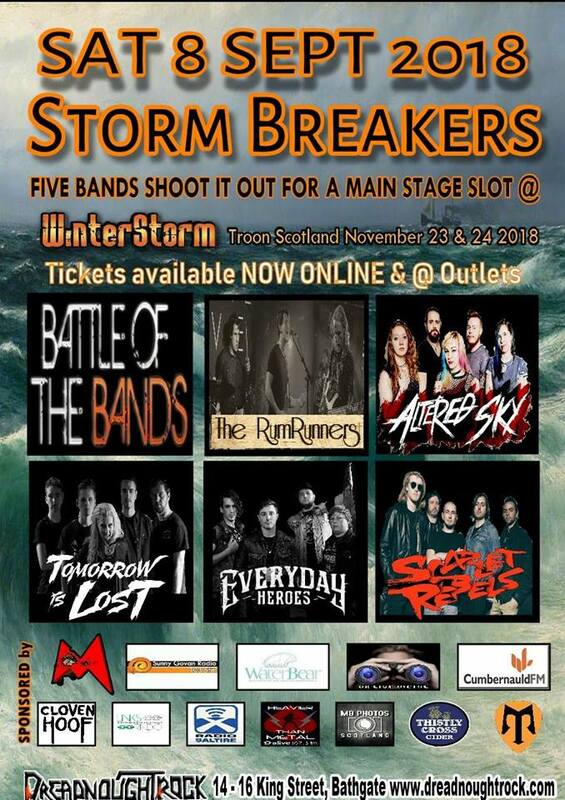 StormBreakers last year was a great night with four bands performing at Bathgate’s Dreadnought and saw Anchor Lane gallop their way to victory and secure a main stage slot at Troon’s Winter Storm. A year later and the event is back with the winners once again getting the chance to play at Winter Storm – which is already sold out this year. This year saw bands from all over the UK make the pilgrimage to make an impression on the judging panel as well as those out for a night of live music. Not only was there the opportunity to play at Winter Storm, the lucky winners would receive a case of Cloven Hoof rum, a photo shoot with MB Photos Scotland, a consultation with Lightning in a Bottle and a merchandise package from MickMick Designs. Runners up would also receive a consultation with Lightning in a Bottle, a merchandise package alongside a sticker pack provided by Ink Clan Nation. Meanwhile, all bands performing were treated to a set of Cloven Hoof miniatures and a video of their set from UK Live Metal. With the running order revealed on the night, Tomorrow is Lost take to the stage first and immediately set a high standard for the rest of the bands. With a modern hard rock sound, the five-piece from Newcastle make full use of the Dreadnought’s small stage. They’re as tight and energetic as last time and it’s obvious they’ve got fans in the room tonight with the reception they receive upon their arrival. Whilst the band focus on their more established material and making sure the crowd are involved, they weren’t afraid to take risks and air some new material with the dark and edgy “Black and Blue” and “Therapy”. Elsewhere, their upcoming single “Shadowgang” gets the crowd raring to go. Altered Sky take to the stage next with their standard plague doctor intro before launching into “This War is Mine”. Taking a more pop/melodic slant to proceedings, it’s still firmly in the rock camp and like Tomorrow is Lost, they give the crowd a chance to hear some new songs. It’s here the band are able to present themselves in a new light, sounding darker and edgier, showing a true progression and with their new line-up, where they work best as the songs have been written with one guitar in mind rather than two. However, as the band close with “Livewire”, it’s still a great song, moulded to fit the new dynamic. The band themselves are on form as always with vocalist Ana displaying her usual verticality, using a flightcase for a riser. Taking the mantle of the heaviest band of the night from the start, Everyday Heroes are intent to let the music do the talking for them. Like those who came before, they show established and new material. New song “Texas Rain” has a bluesy/Southern swagger to it with echoes of early Black Stone Cherry. Elsewhere, “The Ballad of Robert Johnson” allows them to go full-tilt on the blues side of matters but it’s nice and heavy for good measure. Closing song “Delilah” has the crowd joining in for some call and response, they’re as well put together as the rest of the acts and judging from the response of the crowd, they’ve certainly picked up some new fans. RumRunners take the evening back down a notch with less aggression and take a more traditional classic approach to their music. Having seen them before and not exactly been impressed, this time around, they’ve upped their game. There’s more synergy to the band rather than playing individual parts. The other glaring issue from last time with each song sounding like a tribute to another band is gone, too. Whilst they may not be as energetic as the other bands, they’re still visually and sonically engaging garnering a warm reception. It’s more measured, with the rough edges smoothed out. Bringing the night to its end, Scarlet Rebels up the tempo once more. Opting for a traditional hard rock sound, they charge through their set. It’s aggressive, dark and dirty, full of crunching riffs and hooks aplenty. They use their time much like fellow Welsh act, Everyday Heroes to fire through as much of their material as possible. It’s a consistently heavy set from them with the chance to air some fresh songs from their upcoming album. Following in line with the rest of the bands, they’ve got the crowd engaged and make sure they’re entertained. After myself and my fellow judges discuss our impressions of the night, Winter Storm’s Ian McCaig reiterates his sentiments of last year, saying every town should have a Dreadnought – he’s right, you know. He then announces the runners-up and winners. With the high quality from all five bands, it came to pass that the runners-up would also have the chance to play Winter Storm, opening the Friday. That slot went to Tomorrow is Lost whilst the winners would open the Saturday. Making the journey from Wales worth their time, it went to Everyday Heroes. Certainly, it was a tough job for the judges as all the bands were as professional as they could be, all of them giving everything they had to also impress the crowd and it was clear they’d all rehearsed as much as possible – you couldn’t accuse any of being sloppy. Each band had their own contingent of fans rooting for them but hopefully, they also made a new discovery or two along the way.